The 2017 National Electric Code (NEC) dramatically changes the requirements for "Rapid Shutdown of PV Systems on Buildings." Half of the states already adopted NEC 2017 and several more will in the next few months (such as NJ and CT), so you can’t wait any longer to understand what these changes mean to your rooftop projects’ CapEx and OpEx (Pay close attention to Part 2 below). For a recap on the previous NEC 2014 requirements, see our article 2014 NEC 690.12 Rapid Shutdown For String Inverters On Flat Roofs. PV system circuits installed on or in buildings shall include a rapid shutdown function to reduce shock hazard for emergency responders. In an emergency, the responders can initiate the rapid shutdown device, then safely move around the roof knowing any areas within 1' of an array may be energized. As long as they remain more than 1' from the array, any solar AC & DC conductors they encounter will be de-energized. 690.12 Rapid Shutdown of PV Systems on Buildings. (1) Outside the Array Boundary. Controlled conductors located outside the boundary or more than 1 m (3 ft) from the point of entry inside a building shall be limited to not more than 30 volts within 30 seconds of rapid shutdown initiation. Voltage shall be measured between any two conductors and between any conductor and ground. 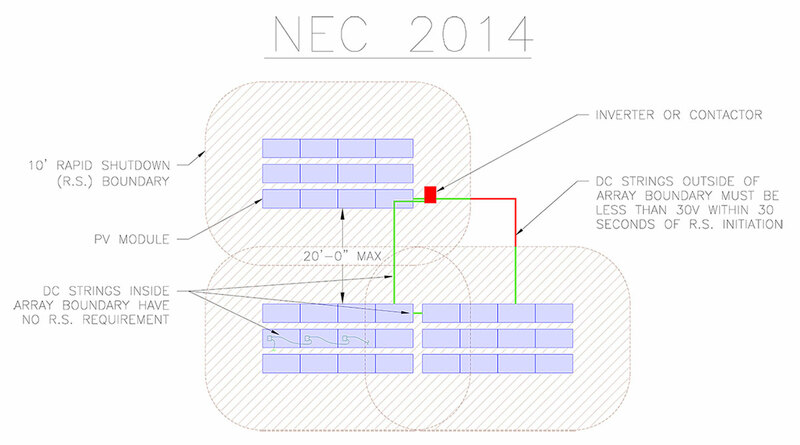 So far, this is similar to the 2014 NEC code, except the distance from the array is now 1’ instead of 10’ with NEC 2014. Getting a string inverter within 1’ of the array can be tricky due to shading and working space concerns, but Pure Power has solutions that work on some projects. In some cases, contactor boxes or other equipment are needed with this 1’ requirement that weren’t needed in the NEC 2014 requirements. The change from 10’ to 1’ greatly limits how we can jump between arrays. As shown in the images below, where you could once jump a gap between subarrays up to 20’ apart, you can now only jump a 2’ gap (which isn’t enough to cross the 8’ fire access paths required by NFPA1 or IFC). (2) Controlled conductors located inside the boundary or not more than 1 m (3 ft) from the point of penetration of the surface of the building shall be limited to not more than 80 volts within 30 seconds of rapid shutdown initiation. Voltage shall be measured between any two conductors and between any conductor and ground. This is the really important part! (3) PV arrays with no exposed wiring methods, no exposed conductive parts, and installed more than 2.5 m (8 ft) from exposed grounded conductive parts or ground shall not be required to comply with 690.12(B)(2). The requirement of 690.12(B)(2) shall become effective January 1, 2019. This “inside the array boundary” part is all new and doesn’t resemble the previous requirements. Sub-item 1 requires a UL standard that isn't out yet, and sub-item 3 is intended for BIPV, so we will skip both. For commercial scale projects microinverters don’t scale well, so using string inverters with MLPE or optimizers will be the most common solution. Yes this means you will need to start budgeting for higher Capital and Operating Expenses for projects in 2019 and beyond. As 2019 and 2020 progress, many innovative and cost-effective solutions will come to market, but there will be growing pains using the first products off the manufacturing line so be sure to increase your O&M budget! (We recommend PV Pros for third party O&M). The remaining paragraphs of the code aren’t as shocking and apply both before and after January 1, 2019. Developers or EPC that use Pure Power for engineering won't need to worry about this section, as we will ensure you meet these new requirements without additional Capital or Operating expense. (3) Readily accessible switch that plainly indicates whether it is in the “off” or “on” position. Where multiple PV systems are installed with rapid shutdown functions on a single service, the initiation device(s) shall consist of not more than six switches or six sets of circuit breakers, or a combination of not more than six switches and sets of circuit breakers, mounted in a single enclosure, or in a group of separate enclosures. These initiation device(s) shall initiate the rapid shutdown of all PV systems with rapid shutdown functions on that service. Where auxiliary initiation devices are installed, these auxiliary devices shall control all PV systems with rapid shutdown functions on that service. (D) Equipment. Equipment that performs the rapid shutdown functions, other than initiation devices such as listed disconnect switches, circuit breakers, or control switches, shall be listed for providing rapid shutdown protection. There are new requirements for the types of devices you use to initiate rapid shutdown. 99% of the time, Pure Power uses the PV system disconnecting means as the initiation device, which doesn’t require any additional listing. Occasionally we need to use a remote push-button device, which now needs to be listed for rapid shutdown. At the time of writing this article, the “listing” standards are still in development, meaning the listing requirement won’t apply until that is released and there are products on the market that have this listing.